Simplest of Saturday suppers. I will not bore you with technique – so little to it. A super 700 gm piece of belly pork from those wonderful folk at Parsonage Farm – roasted after being slashed lightly across the skin, rubbed with a little olive oil, salt, and thyme – at 210c for 20 minutes, then 45 minutes at 160c. Result? Pork Perfection. 5 maris pipers boiled and mashed with butter, black pepper and salt. An onion sliced and pan fried, added to the mash, along with 5 leaves of steamed cavallo nero – the prince of greens and a table spoon of creamy horseradish. This was all then added with care to a large frying pan, lightly oiled where it was mixed further together and lightly browned. Pile it high on a plate – slice the beauteous belly pork and arrange on each plate. Saturdays are made for such culinary delights. Simple ingredients of the highest quality – matched and married for a super supper. 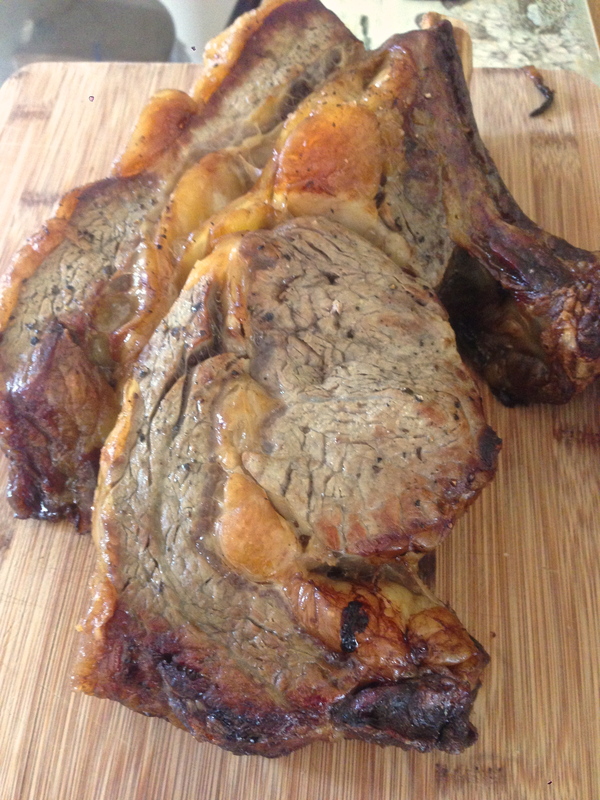 I started this blog a year ago today, so it is fitting that i celebrated the event, and indeed Mother’s Day, with a magnificent 2kg rib of beef from Parsonage Farm. Thank you to all who follow and who have tuned in over the last 12 months. The beef was rubbed in oil and seasoned then laid on a bed of sliced onions, popped in a preheated oven at 230c for 30 minutes, then down to 160c for 1 hour. Key element is to let the joint rest, which I did for around 45 minutes whilst the spuds roasted and the puds rose. All washed down with a marvellous Malbec – my favourite grape. 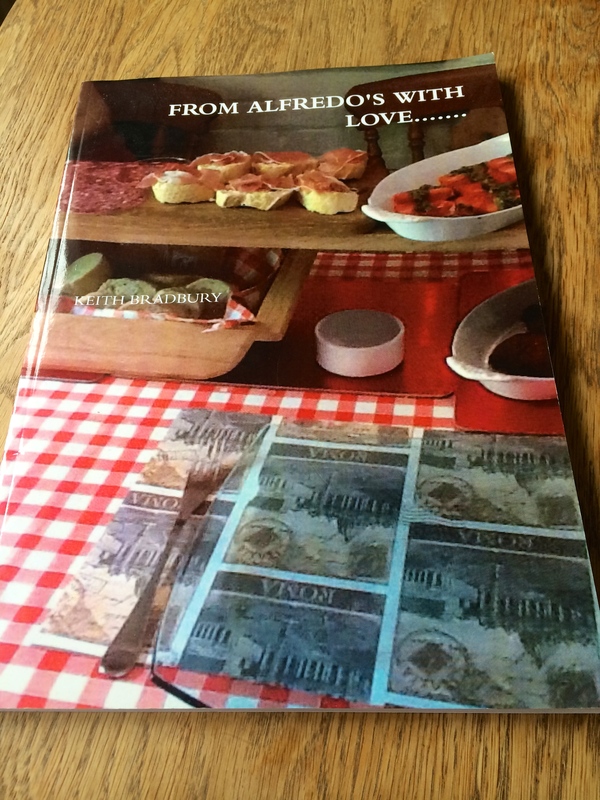 Happy Mother’s Day to all you mums out there and a Happy Anniversary to Alfredo’s too! Demo done…a good evening all round! Last night I was invited to give a cookery demo to a group of around 40/50 people at a Food and Wine evening held at Parsonage Farm in Upton, Hampshire. ( That is me above – I know I look like I am about to fall asleep – but I reckon I was moving so fast my wife couldn’t capture me without a blur! ) It was a very enjoyable evening and my first ever live demo! 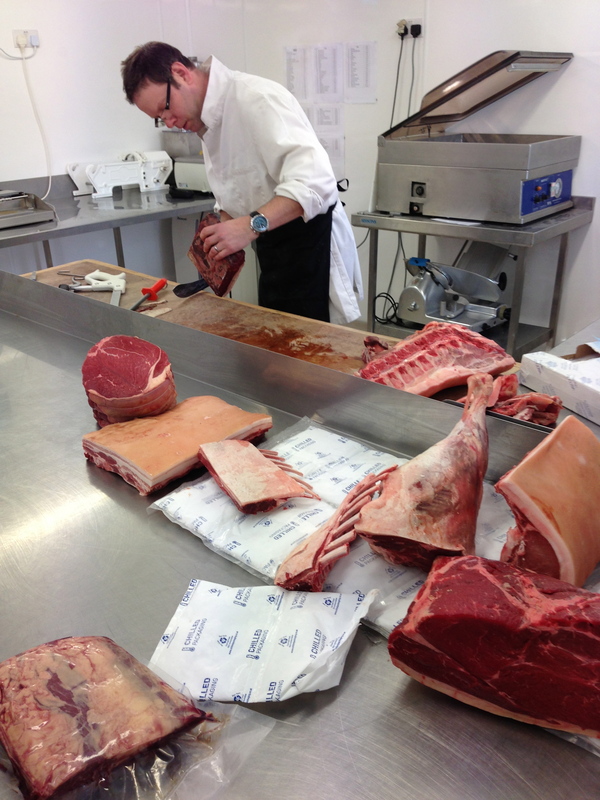 A superb butcher began the evening showing how to bone half a hogget – a lamb that is between one and two years old – so not a lamb and not yet mutton! It has an incredible depth of flavour and I prefer it to lamb. I then followed by demonstrating a dish that could be made from a shoulder of lamb. 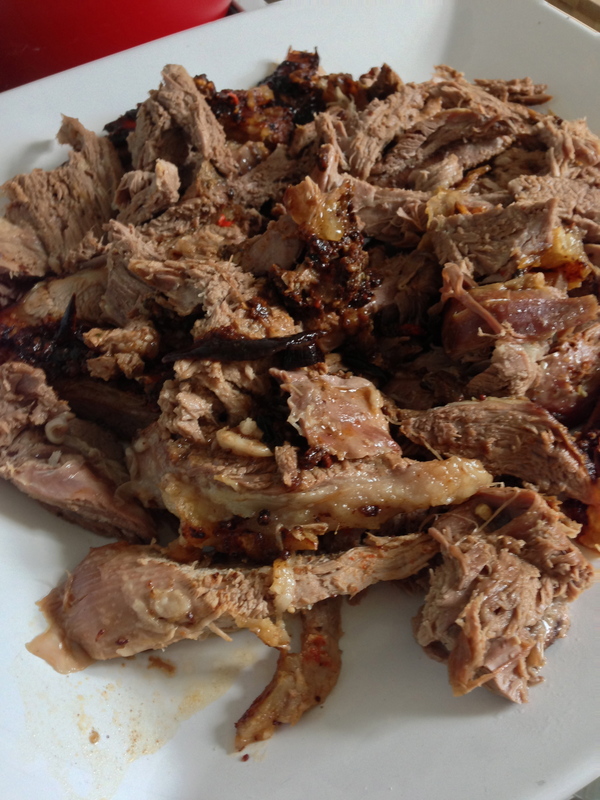 I used the wonderful succulent lamb from the farm and cooked Cordero al Chilindron – see June 24th for the recipe. I spoke for around 25 minutes and enjoyed every moment! 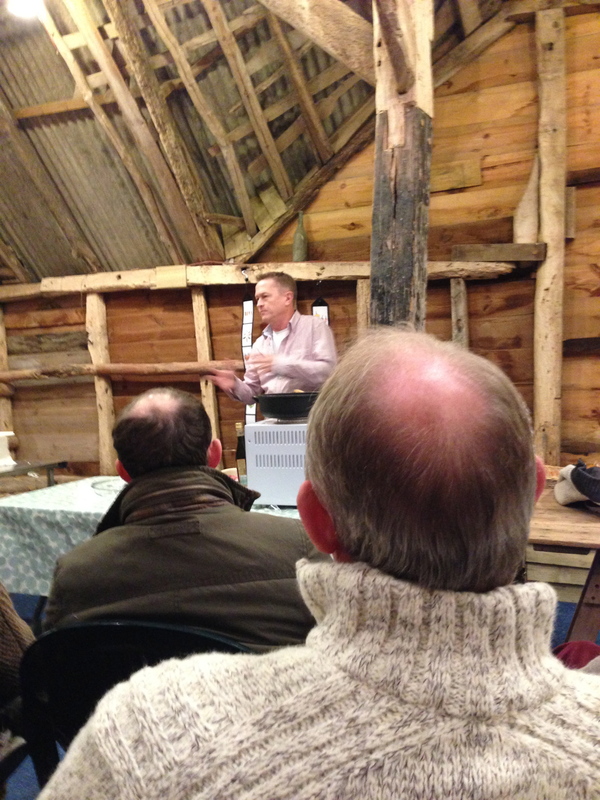 The audience were receptive and I enjoyed their questions afterwards. Everyone got to sample my dish and several other dishes that were on offer – including some fabulous pulled pork that had been cooked in a Thai rub – a mix of various spices – provided by two lovely folk from Anna Valley Chillies – you can see their web site at http://www.annavalleychillies.co.uk – well worth a visit! They do a splendid Hot Banana Ketchup and several rubs for meat. They also have their own smokehouse and produce wonderful smoked salmon and trout. And…they grow all their own chillies! There were folk selling local brews too and a local wine merchant. My thanks to Sarah and John Mills – who own Parsonage Farm – for giving me the opportunity – and to fulfil a lifelong ambition! The barn setting was very atmospheric and intimate. Right, I now have the bug for demonstrating so I will have to search for more opportunities! All I am doing this evening is just sharing my supper with you…and it was all down to just wonderfully old fashioned succulent pork belly sourced from a local farm – Parsonage Farm in Upton. Good meat needs little frills, no fancy sauces – just love and attention. I scored the skin then rubbed it with rock salt, black pepper and thyme. No oil this time and it worked a dream. Crisp crackling and the juiciest tenderest mouth drenchingly perfect pork. It had a blast at 180c for 30 mins then an hour at 180c, then I let it rest for a while. I served it with steamed shredded savoy cabbage and parmesan mash – plus the jus from the meat with a little stock added and some pepper and thyme. I drank with it, a rather fabulous wine from southern France, called Pigassou. That is all you need to know. A very fine and rewarding Monday supper. A happy week to you all! I know, I know, rack of lamb again….boring…sorry, but as it was so good last month I succumbed and ordered another rack from Parsonage Farm – please check out their website! So, we had it ce soir…and I am still in Jersey Royal mode, so these were, once again, bosom buddies with the lamb. But…. I had also a large bag of greens – and I felt that they needed more than just a stiff steam. So, I popped a large wad, sliced pretty thinly, in a wok with an inch of water- put a lid on and let them wilt a tad for 5 minutes. I then drained the green goddesses and whilst they lay recumbent in the colander, I added a grind or two of rock salt and some crushed dried chillies. Whilst they rested, I pan fried some finely cubed chorizo til almost crispy – transferred this to the now clean wok, popped it on the heat and stirred in the greens. The flavour was very very tasty indeed….I could imagine it with turkey at Christmas….but it certainly went well with the lamb. Anyway…it was different…and it brought a hint of warmth, along with the succulent lamb to a frankly disastrously damp Wednesday. The cockles of my heart at least now feel dry and mellow…..
Well…this was one of those days when..despite me thinking it was all going pear shaped..it all turned out absolutely tickety boo! Mid morning shenanigans centring around trying to ferry my 17 year old daughter to a bus stop to go to London for a concert were time-chewingly annoying as she then realised that she had misread the timetable…no bus on a Sunday.and this all occupied steak-like chunks of my time knowing I had folk round for a late late lunch that I had to get into the oven as soon as…anyway, I ended up driving her and her friends to the station..it’s what Dad’s do…but it also put me slightly…understatement being used here big time – behind time…anyway…all I do here is set the scene…I got back in time to throw the tikka marinade together, slam in the lamb, then grab an hour in the sun, shades on, cricket on the radio…and I almost caught up with myself. The leg of lamb was from those lovely people at Parsonage Farm..tis lamb like no other, Real lamb. Lamb that fights back. The recipe is based on an old one of Mr Oliver’s, though I think he uses a shoulder. 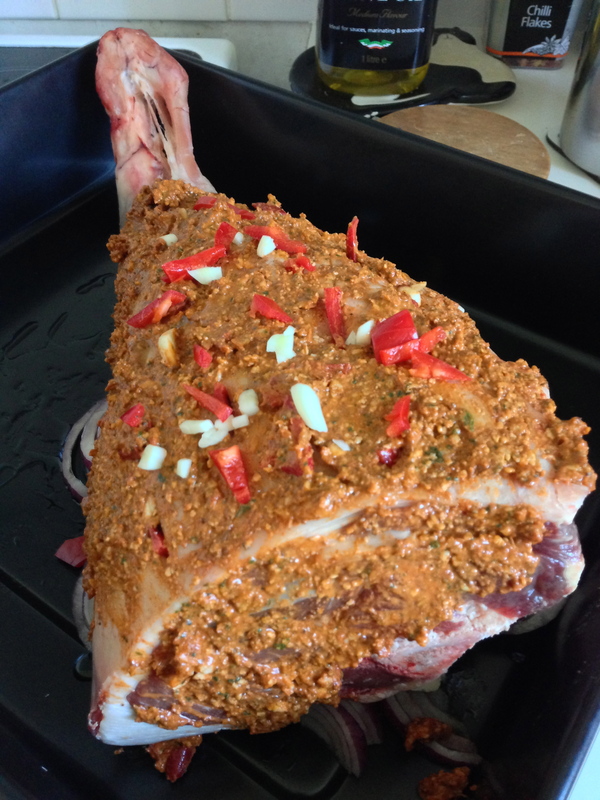 But I had this monster of a leg..and it was crying out for a summer spice mix. So..here we go. Ok- for the tikka paste – you could use a shop bought jar – but why bother? This is funkier and sexier and far far tastier. For the paste – fry cumin and coriander seeds on a medium heat until toasted and smelling good. Add to a food processor with all the other ingredients and whizz until smooth. In an ideal world..I do not live in one but you might….marinate over night…pre heat oven when you are ready to cook it…170c. Lay the red onion slices on the bottom of a roasting tin. Drizzle with oil. Place lamb on top. Pop in the oven , covered with a wet sheet of grease proof paper for 3 and a half hours. Baste every half an hour. The coating will be beautifully wizened as in photo at top of page. Slice chunks off , or pull off with two forks. 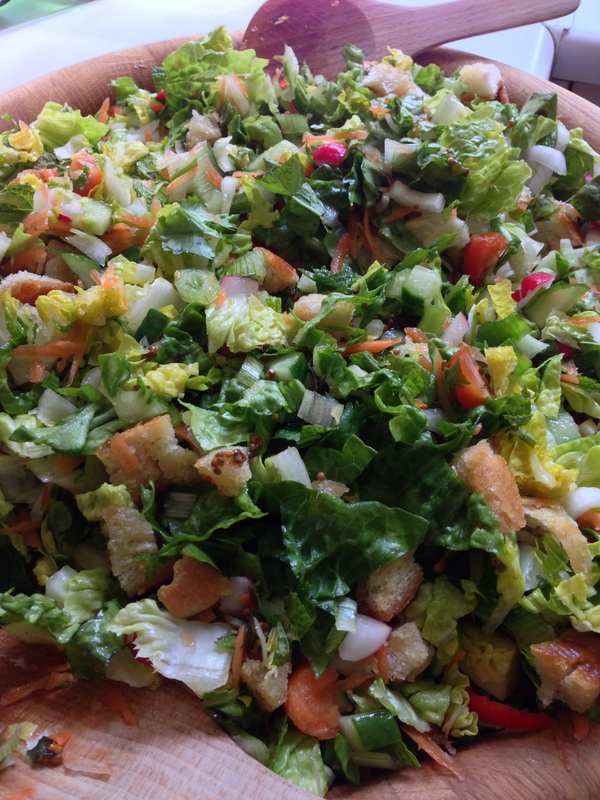 Serve it with this brilliant crunchy Indian Chopped Salad. On a large board add the grated carrot, then chop up finely the cucumber, radishes, lettuce, tomatoes, chilli and the herbs. Add to the board and mix well. In a frying pan, gently fry the fenugreek, mustard seeds and the curry leaves in a glug of oil – I used garlic infused rapeseed oil. When the mustard seeds start to pop and jump – take off heat and add the chutney. Let it cool, then add to the board and mix in with all the other ingredients, plus a little grind of rock salt, and a squeeze of lemon juice. Crumble in the poppadom and stir again. 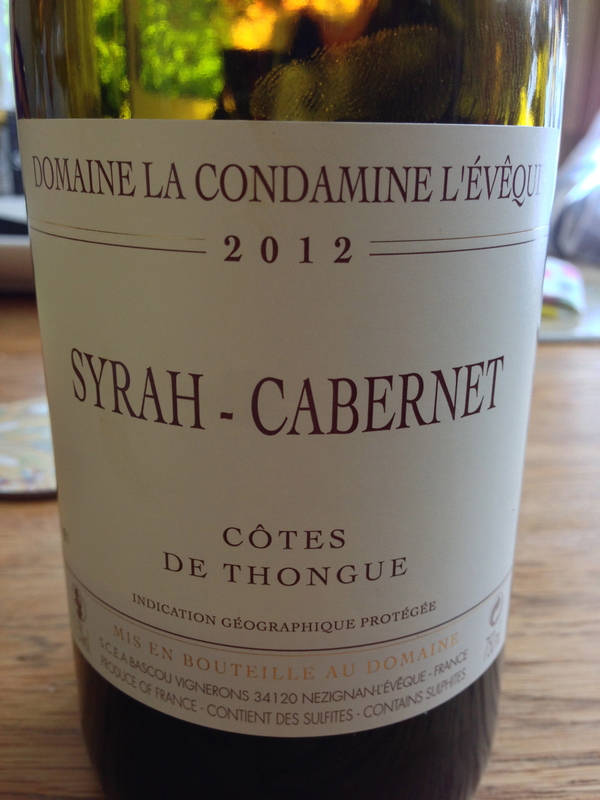 This was a corker of a meal – we ate with friends about 5pm, washed down with this……. well lots of this actually………. 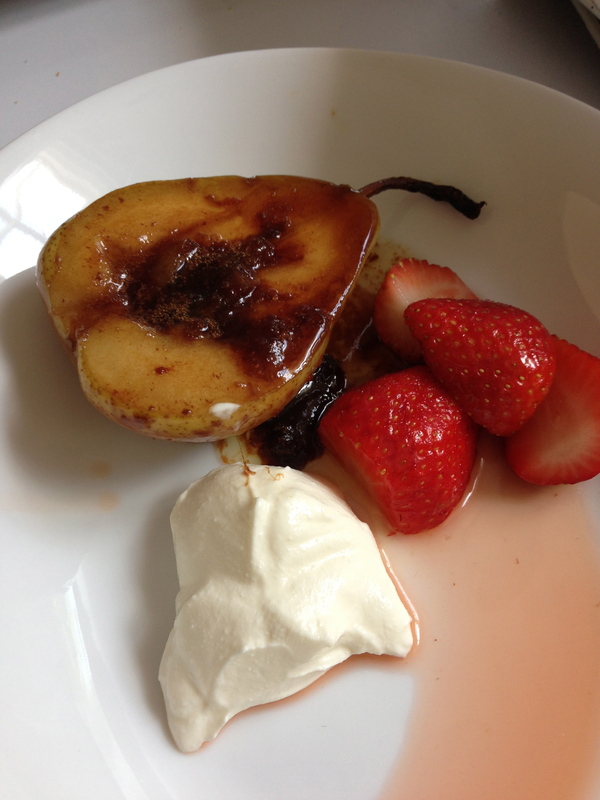 ….and then, for a dessert, which we ate at about 7pm on the garden in the late afternoon sun, I pan fried pears, halved in butter and brown sugar. 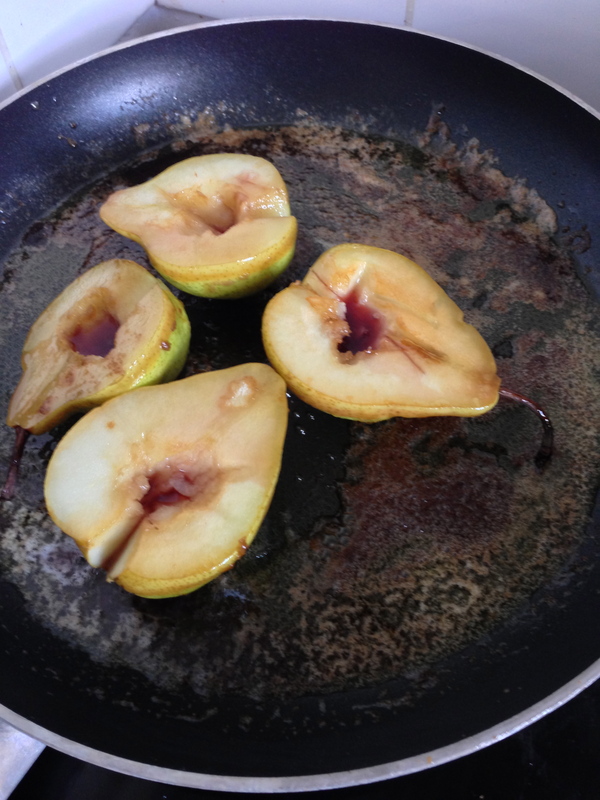 I added sloe gin to each pears centre. Popped a lid on and left for about 25 minutes. I marinated some strawberries in strawberry liqueur for same length of time. I served them together with all the juices and a blob or so of crème fraîche. Lazy Sunday afternoon luxury..and we ate our dessert in the sun, listening to the dulcet tones of Frank Sinatra himself, crooning his heart out. 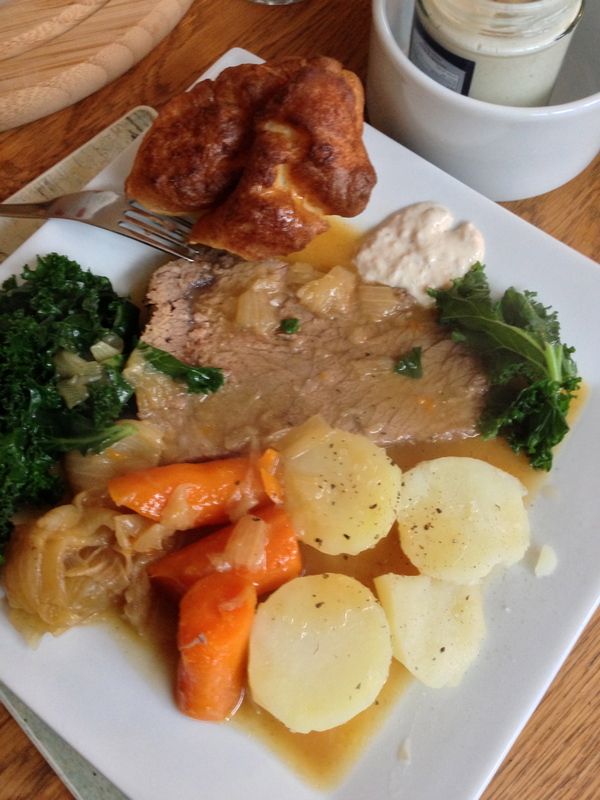 Perfect…..
Today’s late afternoon Sunday lunch was a gorgeous piece of Pork Loin from those fine folk at Parsonage farm. 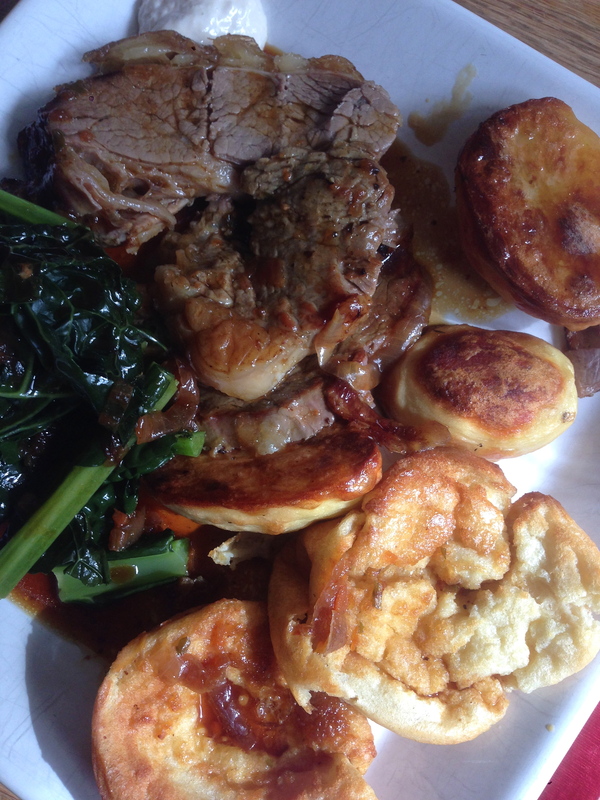 I served it with home made chip roasts, buttered spinach, haricots vert and a light jus..and the crackling was this side of heaven…..that is it – nothing more….nothing less – ’twas perfection on a plate. The view that greeted us when we arrived this morning at Parsonage Farm was pure idyll. 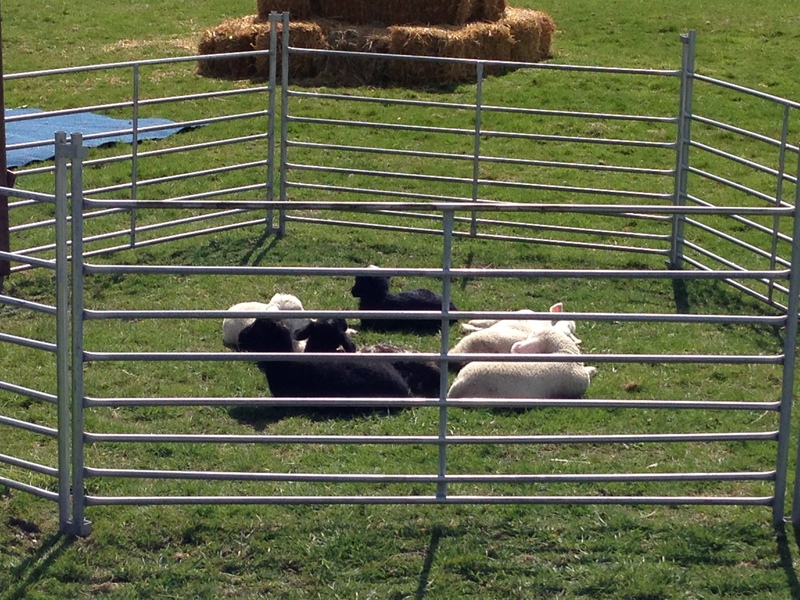 Tiny lambs bleating their hearts out in the spring sun. It was a wonderful few hours, sampling all the local cheeses, hams, pies and drinks. Great craft stalls too…but I was there for the food and drink! Pete’s Pork Pies are always delicious – I bought some of his game pie and my friend bought the pork pie – home made hand raised pastry – meat from Parsonage Farm – all local, all fantastic. 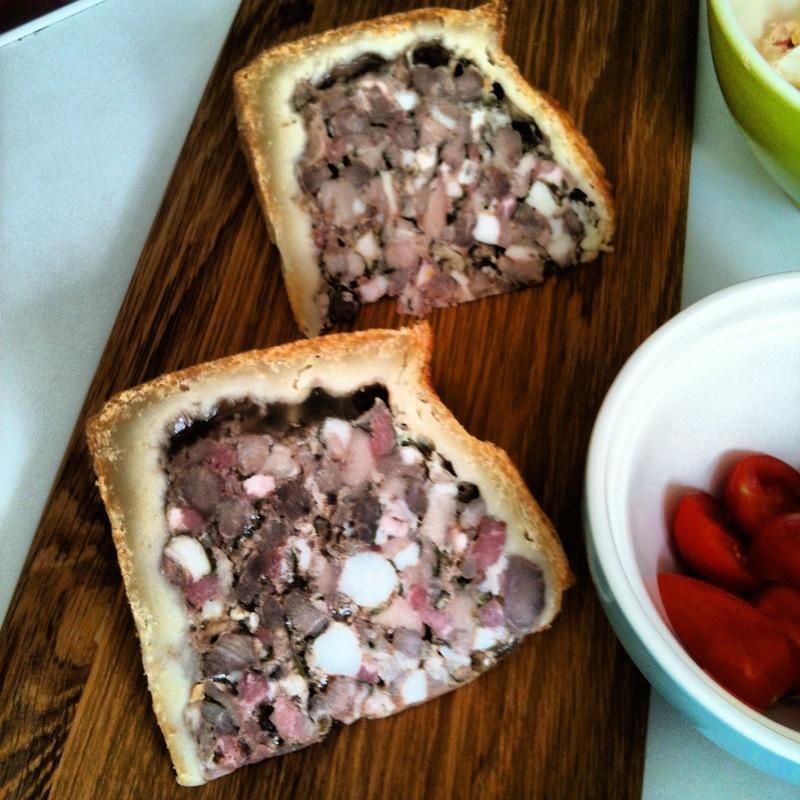 Pic below of the game pie – it was devoured on our return in the garden along with some bottles of local cider to wash it down. (I’ve snaffled a piece away in a secret location for tomorrow…don’t tell anyone!) A company called Gastro Nicks were selling food stuffs imported direct from Sicily and I succumbed to a block of pecorino and a nero d’avola salami. 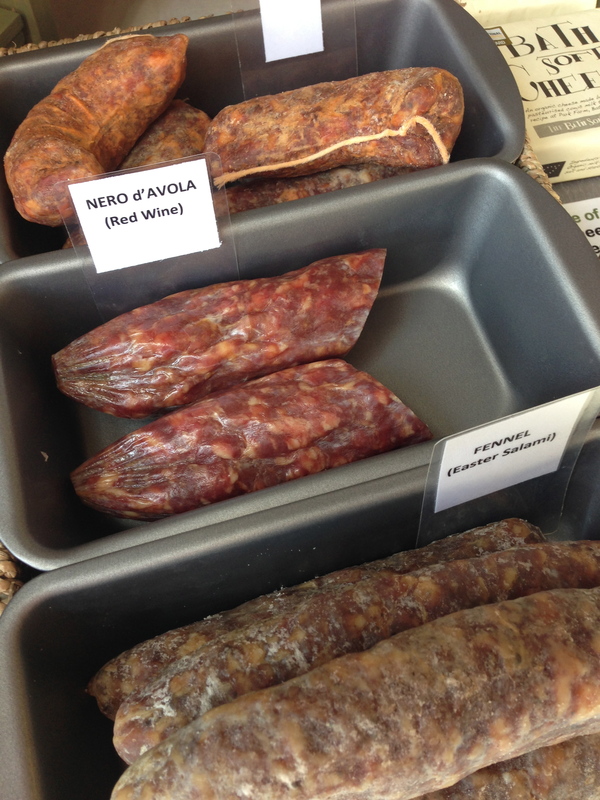 I cannot explain just how sublime the salami tasted! I spent some time admiring and sampling a variety of liqueurs. 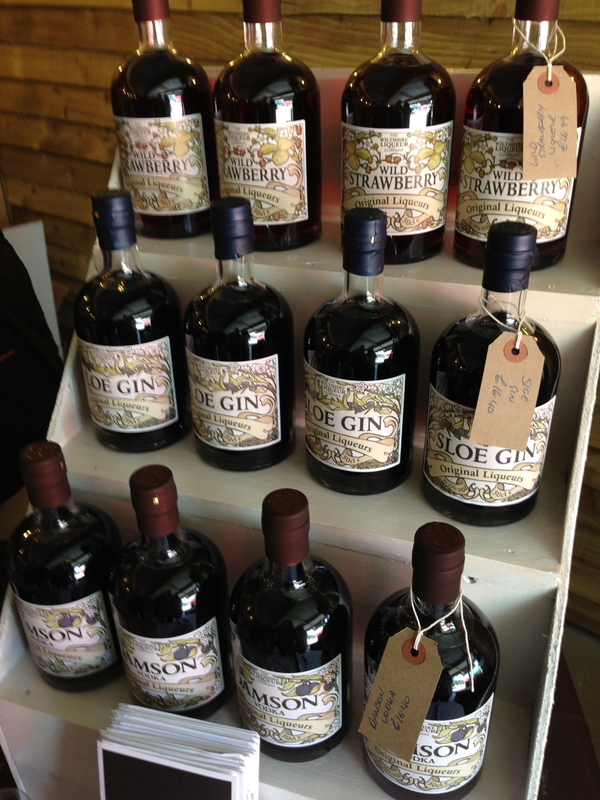 including Strawberry and Damson vodka, before eloping with a bottle of sloe gin….soooo good! Ended up in the butchery at the farm tracking down some phenomenal belly pork for supper tomorrow. Great fair, great people and super produce! Spring is definitely here…let’s hope summer is not too far behind!